Chuck Jones has raised the issue of blogging ("Does Blogging Matter?") 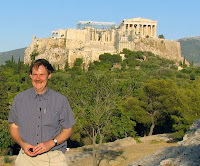 on the Ancient World Bloggers Group. This coincides with the third post of Looting Matters on PR Newswire (a topic that in itself has attracted discussion). So why blog about archaeological ethics? First, it allows a day by day response to what is happening on the antiquities market. And things can happen quite suddenly. Take Friday October 26 2007: Bonhams withdrew a piece of Lydian silver from a sale in London, an article was published on incantation bowls at UCL, and then to finish the day, Princeton announced that it would be returned some of its antiquities to Italy. Web 2.0 technology allows for a swift response; without it, the response would have to be submitted to a journal, and the piece would appear months (at best!) later. Second, it allows a commentary to develop about issues. The July 2008 announcement that Bonhams would be selling antiquities from the Graham Geddes collection in October 2008 gave an opportunity for a sustained series of comments on the sale. It brought about calls from Italy for lots to be withdrawn - and they were. Third, it allows a dialogue to develop with interested parties. Web 2.0 permits people to interact with comments and to post questions. I was even invited to take part in a videoconference seminar on cultural property - and the live discussion had as its background the press release for the return of antiquities from the Cleveland Museum of Art. Fourth, it provides a resource for those involved in discussing cultural property whether in academic books and articles or in the wider media. The post can provide links to academic articles as well as to news reports. Fifth, it is a resource that people are using. There were just under 100,000 visits to Looting Matters in 2008 and that excludes email subscribers or those who view through a reader. Visitors range from academics, museum curators, dealers, government officials, and members of the public. Virtual visitors come from right round the globe, though there is an emphasis on North America and the UK (sharing just over 70% of the visits). A story from Looting Matters that was released earlier today had 66 links by the evening. But blogging is no substitute for academic research that passes through a process of peer review. During the life of Looting Matters related research has appeared in, for example, the International Journal of Cultural Property [link] and the Journal of Field Archaeology [link] as well as chapters in books [link]; there has also been a major review article in the American Journal of Archaeology. There are advanced plans for a study of "toxic antiquities" (and earlier this week we had a lively videoconference to go through the issues); essays on "provenance" and the material and intellectual consequences of collecting the Euphronios krater are in press. Finally, while the destruction of archaeological sites continues, I hope that Looting Matters will be there to offer comment.